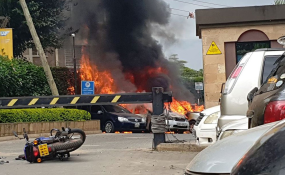 Scene from the attack on a luxury hotel and office complex in Nairobi. The article features a photograph by AP credited to the photographer Khalil Senusi showing bodies of victims of the attack slumped on chairs and covered in blood. A similar photograph has also been used by UK's Daily Mail online with faces of the victims pixelated. Public criticism was initially directed at the author of the article, Kimiko de Freytas-Tamura, who according to her Twitter handle, is the newspaper's in-coming bureau chief for East Africa. She dismissed the criticism telling readers to direct their anger to the newspaper's photo department, claiming that she didn't have a say in the choice of photos that go with her articles. The newspaper eventually responded. But it didn't apologise. Instead it justified its decision to use the photo. It acknowledged that some readers were upset by the photo. But, responders at the newspaper said, they try to be sensitive in how they handle both words and images in such situations. The newspaper argued further that it was important to give readers a clear picture of the horror of the act and this includes showing pictures that are not sensationalised but show a real sense of the situation. It claimed to "take the same approach wherever something like this happens- balancing the need for sensitivity and respect with the mission of showing the reality of these events". Reporting violent terrorist acts is one of the most challenging jobs for journalists. The relationship between journalism and terrorism is complex - think of the often cited argument that the media is the oxygen that feeds terrorism. This isn't true. But it's becoming increasingly clear that terrorist organisations are now quite adept at manipulating the media. Terror attacks no longer just target victims, they also target the public. The aim is to cause both physical and psychological harm which is achieved through the creation of shock, panic and a sense of helplessness. Terrorists create a theatre of death and destruction. The media provides them a stage at no cost. Death and blood elicit shock. The New York Times and the Daily Mail's decision to use that photograph plays into this strategic ritual. I find it difficult to agree with the New York Times argument that reporting about deaths from a terrorist act can only be "realistic" if accompanied by a photograph of dead bodies. This seems to be a deeply conflicted logic. But there is a much more fundamental issue at the heart of this decision. The coverage of "distant death", especially in Africa, by much of the Western press remains deeply problematic. Readers of the New York Times article argued that the newspaper would not have shown bodies of victims had this attack happened in the US or Europe. The newspaper had tweeted that it treats photographs of the bodies of victims the same way everywhere. But one cannot fail to notice that no such bodies are shown of the many terror victims in the US and Europe. The newspaper's reasoning thus becomes a fabrication, one that speaks to one world and not the other. In the recent terrorist attacks in the US the New York Times has faithfully protected the dignity of victims. Their stories have not been told with any less clarity and profundity. The New York Times and the Daily Mail's editorial decisions reveal deeply embedded institutional practices that lay bare the racialised lens that characterises the reporting of "distant deaths". Emotionally removed from the pain and misery of these far off events, distant deaths are often narrated as spectacles . The victims are stripped of their dignity, becoming disposable objects of pity. Images of their bodies are seen as acceptable to the otherwise delicate sensibilities of Western audiences. The double standards aren't accidental: they are institutionalised forms of narration of 'the Other'. Equally problematic is the lack of context provided in the coverage of such events. Distant countries are flattened. This is particularly true of Africa where coverage by the Western press is prone to "compression" - Nairobi becomes Kenya and Kenya becomes Africa. This homogenisation of space fuels the temptation to fall back on the familiar, which unfortunately is an archive of stereotypes with little relevance. This not only contributes to ignorance, it also undermines international efforts to fight terrorism. In an environment where speed and sensation drive audiences to websites the temptation to be the first to report - and to have the most dramatic pictures (however unsettling) - seduces even the most respected news organisations. Ultimately though, audiences are not presented with a balanced view of events and terrorism continues to flourish. Terror attacks must be reported. To do otherwise would be to erode important freedoms. We must guard against the desire to clamp down on free speech and access to information. This would be a triumph for terrorists. But it's not censorship to expect the media to extend some sympathy and dignity to the victims. This must be the case in death as much as in life. Sensationalism comes in many forms. The New York Times and the Daily Mail's use of that photograph was one of them. These newspapers failed journalism. More tragically they dishonoured the victims of the Nairobi Riverside attack.